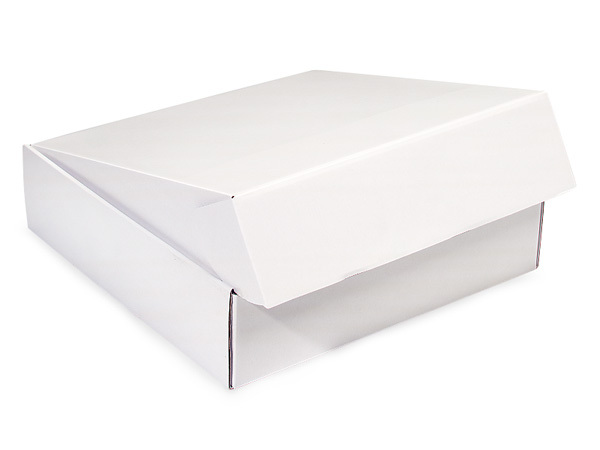 6 x 6 x 2" 8 x 8 x 3" 9 x 9 x 4" 12 x 9 x 3" 12 x 12 x 3"
White Gourmet Shipping Boxes are 1-piece with fold-over lid. Perfect for Christmas gourmet packaging! Outside dimensions of box are: 12-3/4 x 12-1/4 x 3-1/4". These Gourmet Presentation Shipping Boxes have 1-piece construction with a fold over lid. Available in solid colors and seasonal prints. They store flat and are quick to assemble. Made from E-flute corrugated board - these sturdy boxes are made for shipping. Sold in packs of 6.